Nearly four hundred fascinating Isle of Man related diaries, memoirs and travel journals are lodged with Manx National Heritage. We value these for the insights, opinions, anecdotes and information they contain, even when simply recording everyday life and routine. Perhaps you know of other such material still in private hands that might be made available to us – if so please do get in touch ([email protected]). Catalogue descriptions are being tidied up and released to iMuseum to encourage access to these fabulous resources using our search room at the Manx Museum. It is worth bearing in mind whether the author is writing for an audience of one or a wider readership and if they have an agenda to promote when digesting these resources. Some simply make for a page-turning good read; others may have additional evidential and research value. We are lucky that these writers have left us such windows into their lives. By searching using the MS reference number in the pink Archives tab on iMuseum you will find more information but here is a taster of some of the content which has caught the eye of volunteer Sue Nicol and archivist Wendy Thirkettle. 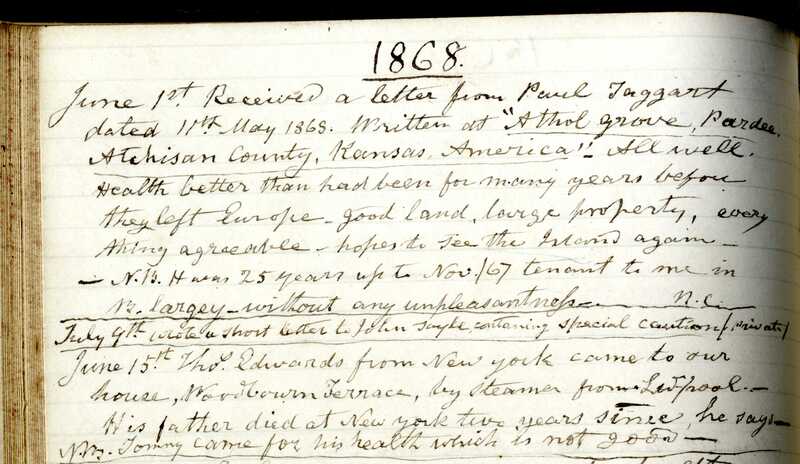 Sue’s pick starts with the diary of Andreas farmer William Sayle spanning 1847-1868 (MS 01237 A) which contains transcriptions of incoming letters written out at the rear. Several of William’s sons emigrated to Australia while other acquaintances kept in touch from North America. 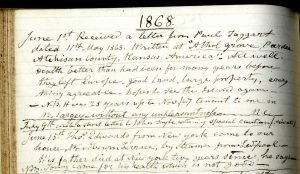 His notebook helps put flesh on the journey, the Manx network operating in Australia and how ties with the Island were fed and maintained. Reverend James Wilks, Vicar of Michael (MS 00297 A) dined with the elite of the Island. He records how he sought to advance himself, so giving a fascinating insight into how the system of employment and promotion worked, a sophisticated system of favour exchanges and turn-taking. Anecdotes may often pack a punch and be told with humour and dry wit. 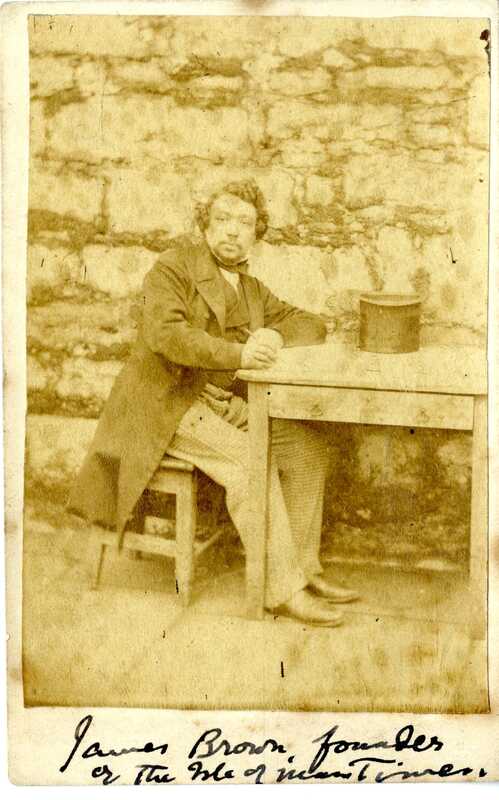 Robert Sim recalls old Crosby in the period 1868-1900 (MS 06345; MD 260) giving wonderful pen pictures of locals including Tom Craine, a pig rearer ‘frequently taken by fairies … when trying to find his front door’ after an evening in the pub or Reverend Robert Wesley Aitken, ‘as a preacher he could hardly be called a star, but as a sportsman his superior was hard to find’. Sometimes the person reminiscing is unsure whether to relay all they know. Thomas Moore of Brookfield. Port Erin (MS 00430 A) in a letter to the Archdeacon tells the tale of Tom the Dipper, a famed local preacher, leading prayers in a private home, asking those gathered to close their eyes and bow their heads in prayer and then taking the opportunity to take a cheese put to dry above him. Resources to catch Wendy’s eye include the childhoods recollected by Catherine Annie Woods, nee Dodd (MS 13657) and Doris Bradley, nee Callister (MS 12376); also Sybil Carlish’s account of working at Howstrake Camp, Onchan during the 1953 and 1954 seasons (MS 14487). Other working life is recalled by Laxey miner Bobby Kelly (MS 13053), gold prospector Joseph Ward (MS 14118) and bomb disposal officer Major Henry Percival Qualtrough GM MBE (MS 13192). Travel journals show how the Isle of Man was experienced from a visitor’s point of view. 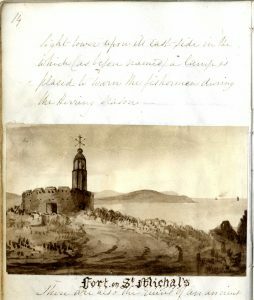 In the case of Mrs Emma Cram’s account of her 1842 tour of the Island with her husband (MS 13029) we get the bonus of water colour and pen illustrations. Above is her depiction of the fort on St Michael’s Isle near Derbyhaven. She writes, ‘This fortress is in a dilapidated state but it is yet sufficiently strong to bear s light tower upon its east side in the which (as before named) a lamp is placed to warn the fishermen during the Herring season’. Extraordinary times such as internment and war are described from many individual perspectives. 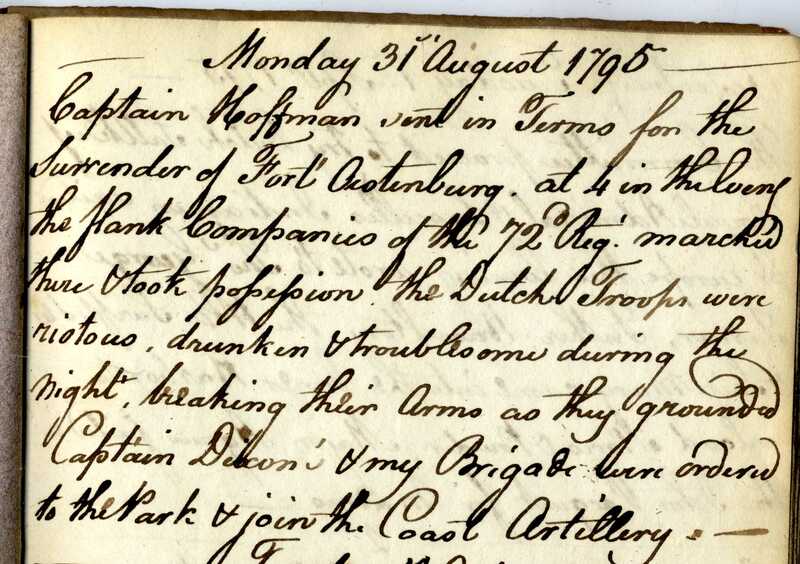 Voyaging many miles from home was Captain John Quayle who documented his time in the Royal Artillery serving in Jamaica, Holland, south east India and Ceylon between 1786 and 1802 (MS 02275, 02278 and MS 02281 A). John was fourth oldest son of Clerk of the Rolls John Quayle of Bridge House, Castletown and brother to George. A gifted diarist and letter writer, John’s military diaries have mostly curt entries but they help chart when and where he was posted as well as recording details about campaign activities. Thankfully his vivid descriptions are kept for his lengthy letters home which survive in the Quayle Bridge House Papers at the museum. 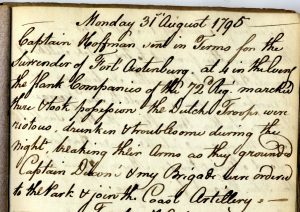 Above, John Quayle records the taking of Fort Oostenburg (later named Fort Frederick) from the Dutch at Trincomalee, Ceylon (present day Sri Lanka) in 1795 (MS 02278 A). Some diarists benefit from being writers to start with: historian and politician A W Moore’s diaries include his entertaining account of helping to host the visit of King George VII and the royal party in 1902 (MS 00167 A – MS 00168 A). 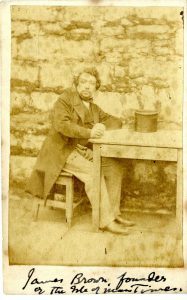 Founder of the Isle of Man Times, James Brown, was imprisoned in Castle Rushen for three months in 1864 for attacking the House of Keys in his newspaper. He tells his side of the story in his ‘Report and Diary of a Political Prisoner kept at Castle Rushen in the Isle of Man’ (MS 14488). Robert Fyson’s 2016 book The struggle for Manx democracy sets the scene and includes a transcription too (available to read in our library at F.64/FYS; M 42919).